About Knowbility: Knowbility’s mission is to create a more inclusive digital world for all people. As a leader in digital accessibility, we provide programs and services that train web professionals, business leaders and others in the techniques needed to create accessible websites and mobile applications. When websites and applications are accessible, everyone, including people with disabilities, can use them. Knowbility’s vision is for a world in which barriers to digital information are a thing of the past. Tell us about your most memorable day (so far) in your work at Knowbility. In 2018, I presented at AccessU, our training conference hosted at St. Edward’s University. In my presentation, “Social Media Management with a Screen Reader,” I showed how I use a social media scheduler and a screen reader to independently plan Knowbility’s social media calendar. Though I had attended AccessU for several years as part of Knowbility’s staff, 2018 was the first year in which I led a session. Sharing with accessibility professionals how I, as a blind person, carry out my job gave me a sense of accomplishment. The unemployment rate for people with disabilities is far higher than for people without a disability. I believe this stems from socially entrenched prejudice that stigmatizes people with disabilities. 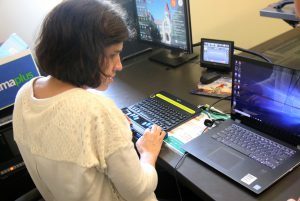 I hope that by giving people a balanced demonstration of how I use assistive technology in the workplace, my presentation added a much-needed perspective on the importance of digital accessibility. 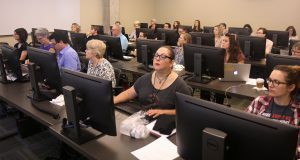 Set on the campus of St. Edward’s University, AccessU gives accessibility professionals, educators, business leaders and other influencers in tech a chance to learn from each other and build lifelong relationships. Most of our audience comes from Texas. We also host many others from across the country and beyond. We’ve hosted attendees and presenters from Canada, the United Kingdom and Germany. This year, we’ll have a presenter join us all the way from Japan! Accessibility is a global issue, and our conference’s reach is proof. AccessU 2019 promises to be another well-attended conference. We’ve added an extra half-day to allow for encore presentations of our most in-demand sessions. Last year, we had record attendance with 410 attendees and presenters. 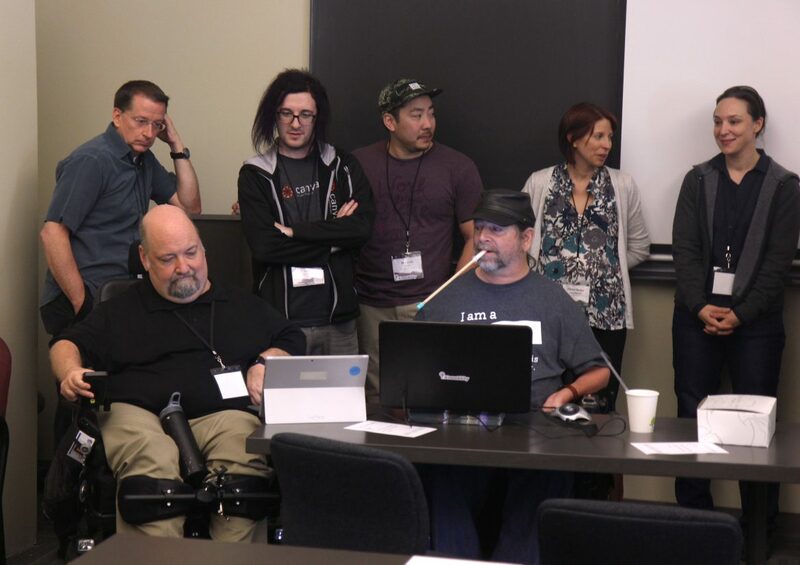 The multitrack conference offers lectures and hands-on workshops on a wide range of topics ranging from mobile accessibility on Apple’s iOS and Google’s Android operating systems, to PDF accessibility, to advanced HTML techniques. What are you using the funds for? Why is that significant? We aim to deliver a more ambitious conference in 2019. The generous gift from the Moody Foundation will go towards speaking fees and travel for eminent figures in the accessibility and disability advocacy community. We’re exploring the creation of a scholarship program for college students and recent graduates. Greater engagement with these groups would dramatically increase our profile beyond the typical sources of interest. In the current era of digital transformation, it is of the highest relevance to our mission that students and young professionals in computer science and related fields learn the practices and techniques needed to produce accessible web content and mobile applications. Who do you serve at AccessU 2019? How many people? Attendees to our conference include folks working for Texas government agencies and other government organizations from across the country. Other attendees and presenters represent the tech sector, K-12 and higher education, marketing and hospitality. AccessU 2018 brought together more than 400 attendees, and we are projecting 500 for this year. Beyond training those who come in-person, we expect that they then share what they learn with their coworkers, creating a force multiplier. Furthermore, we make the content of sessions available online to attendees. What are you hoping to achieve in the next several years? We hope that AccessU’s reach continues to grow in attendance and community support. We want to attract more attendees from underrepresented sectors such as finance and hospitality. Additionally, we want to strengthen our engagement with students and young professionals. We aim to offer greater incentives to instructors such as stipends for travel, lodging, and daily expenses. The funds from the Moody Foundation are already helping us further our mission. Knowbility is an established leader in Texas, and it’d be wonderful for our brand to be known in more venues across America and around the world.